George R. R. Martin’s beloved fantasy book series, A Song of Ice and Fire, is being adapted into a tv mini-series by HBO and they have just released the first (info) trailer. 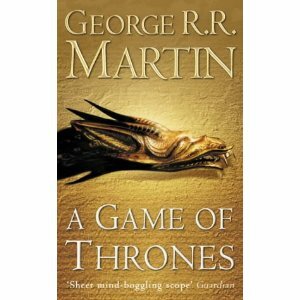 The mini-series, Game of Thrones, is titled after the first book in the series. The show debuts April 18, 2011. The book series is slated to span across eight books, but Martin has yet to produce the fifth novel, A Dance with Dragons, since the fourth’s release in 2005. Several of my friends have expressed their consternation with his writing pace, so maybe the mini-series from HBO will finally get him in gear. This entry was posted in Uncategorized and tagged A Song of Ice and Fire, Book adaptations, Fantasy, Game of Thrones, HBO, mini-series. Bookmark the permalink. Game of Thrones is a full series, not just a miniseries. I think it has a short first season even by HBO standards (looks like 8 episodes), but I’m pretty sure it will go on beyond that (if it does well, that is, which I’m sure it will). “Game of Thrones” appears both fascinating & intriguing. I just recently viewed the “Game of Thrones” Extended Version Clip (11:15)…It seems Martin & Production Team may have shown me a fresher fantasy world that may not have been done in quite the style that “Game of Thrones” has apparently achieved. First, The Large Male Warrior with the darkened features (He was shown around Lena Headey & Emilia Clarke’s two characters) reminded me of a kind of bipedal centaur. In fact, the shot of the warriors riding up on horseback momentarily made me believe that they were centaurs, not bipedals on equines. ( my paraphrasing only) ….When the White Walkers….When the Sun Hides For Years….That is when ….Fear…. Am experiencing some wistful yearnings for…H.B.O.! I’ll be reading at least the first of four novels–If it is really impressive, I’ll move on to second volume, and so forth! Looking good, HBO. Looking good. And I chuckled when Martin said “my 7 kingdoms”. He put some emphasis on the ‘my’.